On May 25 2017 the “Aegean Gardener” project was inaugurated by the South Aegean Region in cooperation with the South Aegean Regional Plant Nursery in Kos, the island of Hippocrates, the Father of Modern Medicine, in the framework of the European Region of Gastronomy Award 2019. 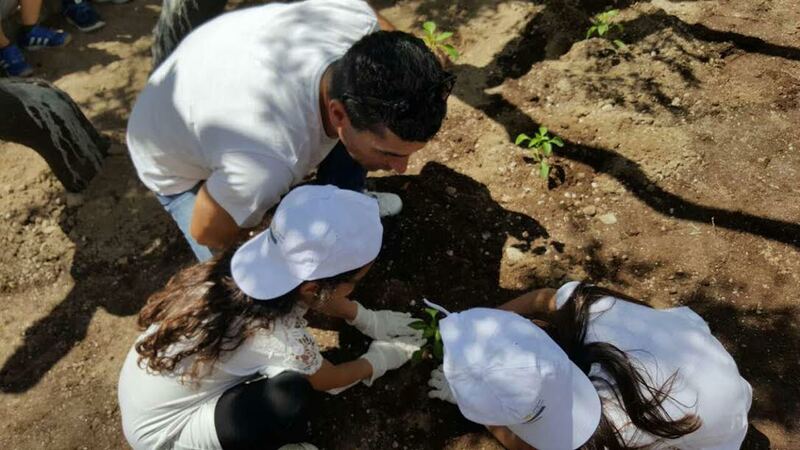 The implementation of the “Aegean Gardener” project started with the pupils of the 7th Primary School of Kos Town, which was recently renovated by the South Aegean Region with NSRF funds, making their own vegetable garden. The President of the Regional Plant Nursery, Mr. Mihalis Barianakis, the Prefect of Kos, Mr. George Halkidios, the Vice President of the Regional Plant Nursery, Mr. Dimitris Hamatzoglou, the Regional Councillors Mr. Nikos Tsakiris and Mrs. Evridiki Naki, the Head of the European Region of Gastronomy 2019 Executive Committee, Mrs. Heidi Lazani and the Director of the South Aegean Regional Plant Nursery Mr. Nikos Renesis were present at the event. The students watched the members of the Regional Plant Nursery plant vegetables and then, in collaboration with them, created their own small vegetable garden in the courtyard of their school while being informed, at the same time, about the traditional ways of cultivation. After planting the vegetables in their garden, the students watered them and committed to taking care of them until they were fruitful. The Aegean Gardener project aims to introducing young pupils early to the Aegean Diet and its benefits through the production of traditional vegetable products by using local seeds. In this way, children learn about the cultivation cycle of fruit and vegetables, thus having the possibility to become farmers in the future and support local production, by cultivating local products of high nutritional value. More visits like this one will be organized within the next month to five other schools of the South Aegean Region and, starting from the new school year, the project will be implemented horizontally in all the schools of the South Aegean Region, in the Cyclades as well as in the Dodecanese.